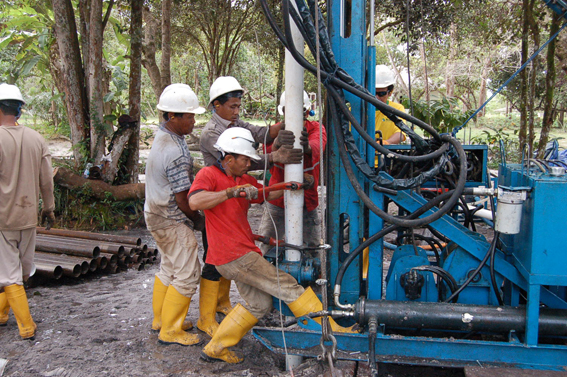 Kalimantan Gold Corporation (KGC) has been preparing for a major drilling program to start early in the New Year. Part of this includes completely rebuilding the two drill rigs and drilling some test drill holes. KGC has established a large staging camp at KM 37 on Jl Cilik Riwut only two kilometres away from Rungan Sari. Bachrun Bustillo mentioned that during the dry season the existing wells in Rungan Sari sometimes run dry because they are not deep enough only going down to about 20m. KGC decided to test one of the rigs in preparation for the major drill program in January by drilling a deep reserve water well at Rungan Sari. The well went down to 44m about 2 m in to granite bedrock. At 36m we hit 0.3m of coal! We are proposing to start strip mining in Rungan Sari in early February....just kidding! The seam is a poor quality coal and is too deep to be economical. The hole was 4” wide most of its depth and should make an excellent reserve well for the community in the dry season providing a more secure water source. The drill rig passed with flying colours and is ready for the field.